So Christmas is over and we are nearly through the January birthdays so I am in planning mode! I looove planning for the new school year and rearranging our learning space. I think it must be the teacher in me, I was always a planner!! We will have a big focus on geography this year as my kids are slightly geography obsessed. So it made sense to set up our geography area first. This set up is mostly for Liam and Samuel. Liana does geography at our Home school group and is way beyond this. She can pretty much locate most of the 196 countries and know about 50% of their flags too. We have a subscription to Little Passports this year. We will be receiving the World Edition for Liam and the Early Explorers for Samuel. Each month I will change the table to focus on the continent that matches our Little Passports country. I plan on using a lot of the ideas from Living Montessori Now for Sam as well as some extension activities for Liam. 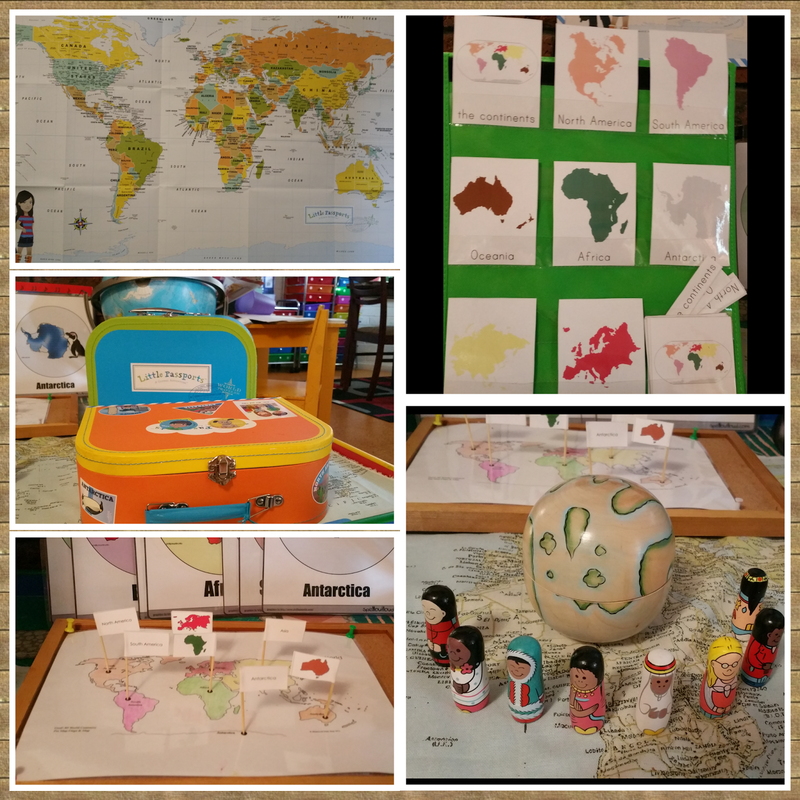 The first month is a general introduction, so our table is focusing on the continents and oceans. 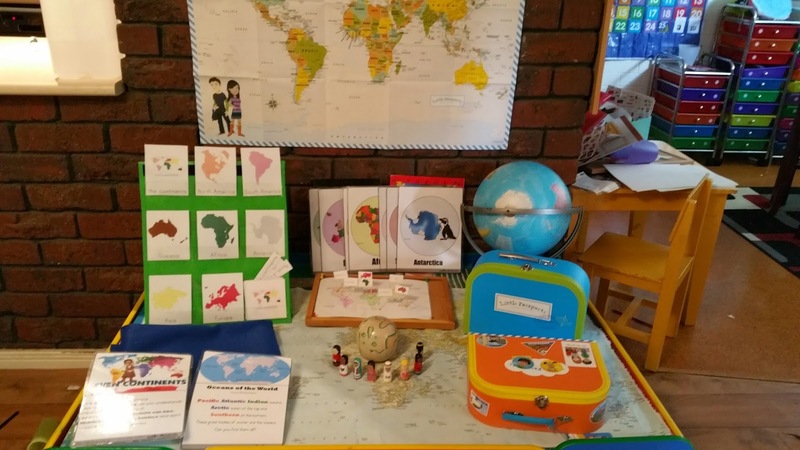 We have our World map to track Sam and Sofia (from Little Passports) as they travel around the world, Our Montessori inspired continent 3-part cards, our Little Passport suitcases, A world pin map - one side is colour coded for easy matching and the other side is plain to make it a bit harder. 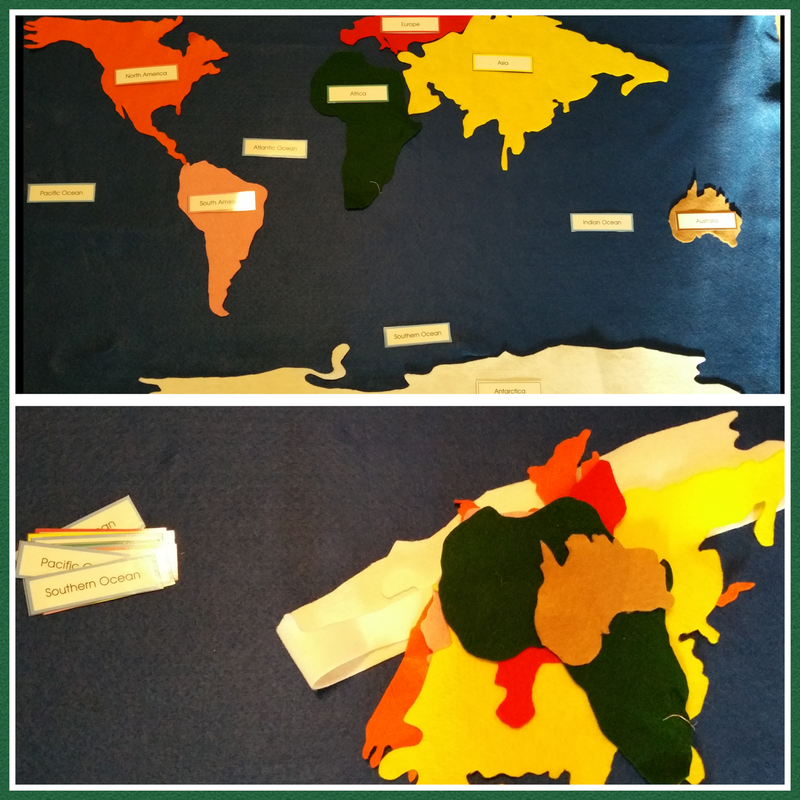 Then we have our felt continents map complete with labels for the continents and oceans. Through the year we will keep adding things to this map like landmarks, animals and flags for the children to locate on the correct continent. So there you have it, our geography corner. Next on the list is our science corner!